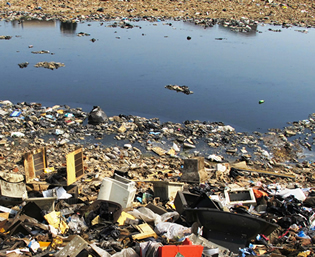 Wastes, including electronic waste, are subject to the federal Resource Conservation and Recovery Act (RCRA). Some electronic wastes – like cathode ray tube (CRT) TVs and monitors are classified as hazardous waste in the U.S. because of the hazardous materials inside. But if certain electronic wastes (CRTs, whole used circuit boards, shredded circuit boards) are sent for recycling, EPA rules sometimes exempt these from their definition of hazardous waste. Because of the federal exemptions, it’s legal to export almost all electronic waste from the U.S. to developing countries. RCRA says you can’t sent hazardous waste to developing countries without their consent, and the EPA has a “prior informed consent” process for this purpose. But because the EPA has enacted rules that exempt these various kinds of e-waste from the definition of hazardous waste, the export rules no longer apply to these products if they are being exported “for recycling.” The only law that currently restricts e-waste exports in any way is the federal CRT Rule. Note that the 2014 changes in the CRT rule go into effect as of Dec. 26, 2014. The EPA’s website on e-waste regulation is here. Note that many states have enacted waste laws that are stricter than the federal laws. Also, because there is no federal law on electronics recycling, many states have passed e-waste recycling laws. For the last 2 sessions, members of Congress have introduced a bill called the Responsible Electronics Recycling Act (RERA), which would make it illegal to send toxic e-waste from the U.S. to developing nations. (The most recent version was HR 2791.) Despite bipartisan support in the House, the subcommittee chair would not schedule the bill for a hearing. This bill has not been reintroduced in the 114th Congress. The bill was supported by environmental groups as well as electronic manufacturers (Dell, HP, Samsung, Apple, and Best Buy), all of which already have policies that prohibit the export of e-waste to developing nations. It ws also supported by a recycling business coalition, called the Coalition for American Electronics Recycling (CAER). E-Waste Export Briefing Book – Learn more about the problems that this bill is meant to address. Congressional Work on a National Takeback and Recycling Program. There is currently no federal legislation pending to establish a federal takeback program. Click here to learn more about this issue. Information on federal administrative policies on e-waste is here.